Stunning, 'A' Grade Clear Quartz, Vogel-style pendant, set with genuine semi-precious chakra cabochons in 925 sterling silver. Far better than they (we have 4 pendants available) appear in the photo; with more sparkle, energy and clarity. Absolutely gorgeous! 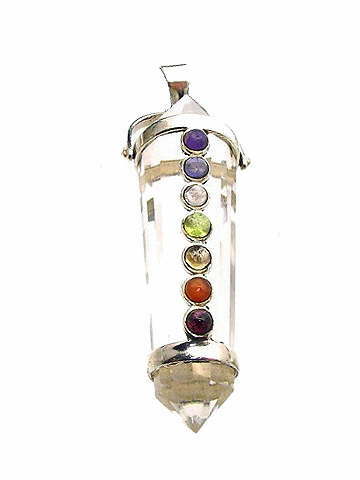 The chakra cabochon crystals on this super pendant are Amethyst, Sapphire, Rainbow Moonstone, Peridot, Citrine, Carnelian and Garnet. Powerful healing tools, these Vogel-style pendants exude a perfect Yin Yang balance of energy and promote harmony, healing and enlightenment. Their energgy is equalled only by their beauty. The larger end of the crystal is the female, receptive end. It draws in energy (life force/Universal energy/Prana/Chi), which spirals through the length of the crystal, being amplified every time it hits a facet. The other end of the crystal, which has a sharper, more elongated point, is the male end - the focusing point. It was discovered that by cutting Quartz in this shape, to certain exact dimensions consistent with Sacred Geometry, it produces an instrument that has the same vibration as structured water - with a high frequency signature of 454 - the same frequency of holy or sacred water. As well as powerful energy balancers, these pendants can also be used as wands or pendulums for dowsing - for clearing energy blockages in people, animals or in your environment. Clear Quartz is probably the most versatile crystal of all. It has six main properties. It can structure, store, amplify, focus, transmit and transform energy on all levels including physical matter, mental thought and emotional energy. Generally speaking Quartz can energise all levels from the physical to the subtle. Just holding a piece of cleansed Clear Quartz has been shown (via Kirlian photography) to greatly increase the size of the primary layers of the aura. We have four of these exquisite pendants available. Being a natural product each will differ slightly from the other, but will be of equal quality. They are beautifully clear and some have light-bearing rainbow inclusions. Comes with black, silken cord. Want to know how to cleanse crystals? Check out our online Library and look for the article titled 'Cleansing & Programming Crystals'.